Car parking can be a particular problem for some; although the number of cars in many households is ever-increasing, generally newer house building features smaller gardens and surrounding land areas and a reduction in the number of garages being built. There’s also the issue of where to park if work is being done where owners might usually leave their cars – for example, if parking on the street and roadworks are in progress. Parking on your lawn is an option, but usually a less than satisfactory one as grass can soon become damaged from tyres; a problem exacerbated after rainfall and during frosty conditions. Help is at hand though. Specialist surfaces are available designed to protect grass when heavy loads such as cars are placed on it. A Witham based company offer various options with their Suregreen grass reinforcement range of mesh and matting. Available in various types depending on what levels of ‘traffic’ the grass is likely to experience ranging from occasional and heavier pedestrian use up to the parking and manoeuvring of cars and other vehicles. As its name suggests, it’s an interwoven mesh made of plastic and is designed to reinforce the grass as it grows. The roots and sward of the grass intertwine with the mesh to create a stronger, reinforced surface. This, coupled with its ability to spread the weight of vehicles, helps preserve the grass. The mesh is available in various specifications and grades; some versions are capable of bearing loads of over 7 tons and vary in design depending on how quick drainage is on the specific area of grass. Some mesh types are more suitable for sandy based grass with quicker drainage whereas others are designed for clay type surfaces where drainage is much slower. The mesh is available in various sized rolls and is easily laid and fixed in place usually using U pins at specific intervals. For example, if laying a 2 by 20 metre roll of mesh then something like 200 pins would be required. Made from HDPE (High Density Polyethylene), these mats – typically just over 12mm thick – are simply put in place on the grass to provide a sturdy, non-slip surface. They protect the grass by spreading the weight of the vehicle and preventing its tyres from pressing into the surface and eventually causing ruts. However, many mats are necessary to provide the required area of parking and grass protection can be laid and interlocked with simple connectors to give a single, solid surface. They’re a more durable solution than fibreglass or plywood, and can offer good levels of grip on more uneven grass surfaces and – due to their composition – can handle expansion and contraction as weather conditions and temperatures change. Each mat weighs about 40 kg so they’re convenient to move around being only the weight of two suitcases filled to most airlines’ luggage allowances. Due to their portability, these mats make for an ideal temporary surface. For example, if you need some ad hoc extra parking for an event at your home such as a party, or to provide parking while work is going on in the street where you normally park such as pipe laying or similar, then ground protection mats offer a flexible solution. 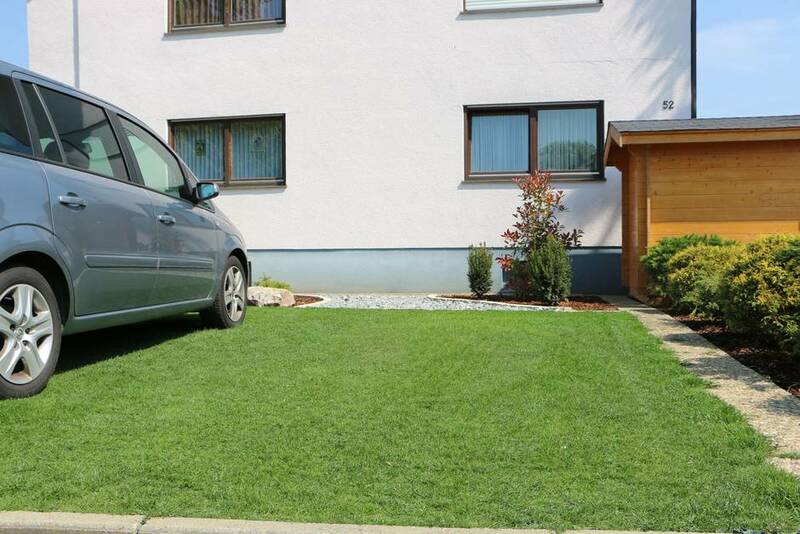 As the above illustrates, there are ways of creating extra parking and hard standing for cars and vehicles without ruining your lawn.